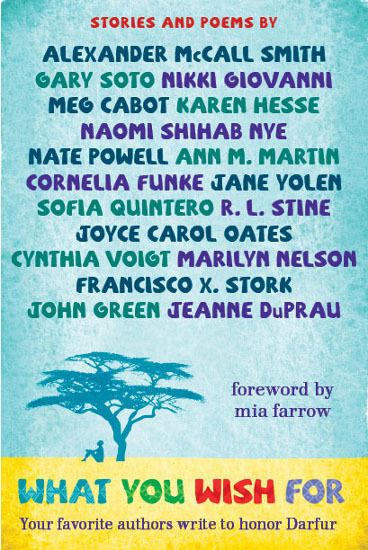 In What You Wish For, some of the world’s best-selling and most highly honored writers for young adults and children share stories and poems that captivate, inspire, and offer hope about things we all wish for. Together with Darfur advocate and UNICEF Goodwill Ambassador Mia Farrow, who wrote the book’s moving Foreword, they contributed to this amazing collection for free so that the proceeds could be used to fund libraries in Darfuri refugee camps in Chad. What You Wish For received a starred review in the Oct. 1 issue of the American Library Association's Booklist magazine. Featuring stories from the authors of The Princess Diaries, The Baby-sitters Club, Goosebumps, The No. 1 Ladies' Detective Agency, Inkheart, The Fault in Our Stars, the Newbery Medal-winning Out Of The Dust and Dicey's Song, plus many more beloved titles, What You Wish For is sure to excite readers with its insightful and oft-times humorous look at issues teens care about, such as love, friendship, family, and bullying. But this stunning collection is more than just entertainment, it's for a good cause. Book Wish Foundation, an all-volunteer 501(c)(3) public charity founded by a mother-son team, organized the book and will donate 100% of its proceeds to the UN Refugee Agency, UNHCR, to build the refugee camp libraries. More than 250,000 refugees from Darfur live in 12 refugee camps in eastern Chad, and they have a tremendous need for books for their education and well-being. More than half of the refugees are children. Get a fantastic book for yourself while helping some of the world's most vulnerable readers by ordering now. You can make a difference. More than 250,000 refugees from Darfur live in 12 refugee camps in eastern Chad, most under the age of 18. Thousands lack the basics of education — textbooks and knowledgeable teachers — especially beyond primary school. Libraries built with your support will provide critical resources for students and teachers. And for the traumatized victims of genocide, a chance to heal through reading. Join the incredible writers supporting this cause by ordering What You Wish For today. Book Wish Foundation is working closely with the UN Refugee Agency, UNHCR, to maximize the impact of funds raised from the book.